I left off with Jimmy, Sadie, and I having breakfast and resting after she was born in part I of Sadie’s birth story. After we had some time to connect as a family, the nurse wanted me to get up, go pee, and maybe take a shower. She helped me off the bed and to the bathroom where I peed a little and then promptly passed out. I woke up on the floor of the bathroom smelling ammonia. The nurse had smelling salts under my nose to wake me up. She helped me off the ground and back into bed. About 20 minutes later, we tried to get me to pee and get cleaned up again but I passed out again and needed smelling salts to wake me up. A little while later, we thought the third time would be the charm, but no luck. I couldn’t pee and almost passed out once more, but the nurse got me back to the bed before I fully fainted. By this point, the nurse and midwife were palpating my belly and couldn’t find my uterus. They were concerned that my bladder was so full that my uterus couldn’t move down to where it needed to after birth and that I’d continue to bleed. Bleeding is obviously a danger with childbirth, but my anemia made it a little more serious. We all agreed that since I kept passing out while trying to get up and use the bathroom, it was a good idea to try a catheter. Ugh. The catheterization process was 100% worse than labor and delivery. Thankfully, I got through it and was able to have a liter of urine drained. Crazy! By this point, the midwife had called 911 again and we prepared for a transfer to the local hospital. The nurse and midwife weren’t comfortable with how much I had passed out combined with blood loss and my anemia, so they wanted to have my hemoglobin levels tested, get my hematologist’s opinion on anything that would need to be done at the hospital regarding the results, and just have me monitored for a bit. So, the paramedics arrived around 10:30 AM and off I went into the ambulance. It was so incredibly hard to leave Sadie and Jimmy. I just remember laying on the stretcher and seeing Jimmy cradling Sadie in his arms among all the people in the room. The plan was for Sadie to be discharged from the birth center and for Jimmy and her to meet me at the hospital. 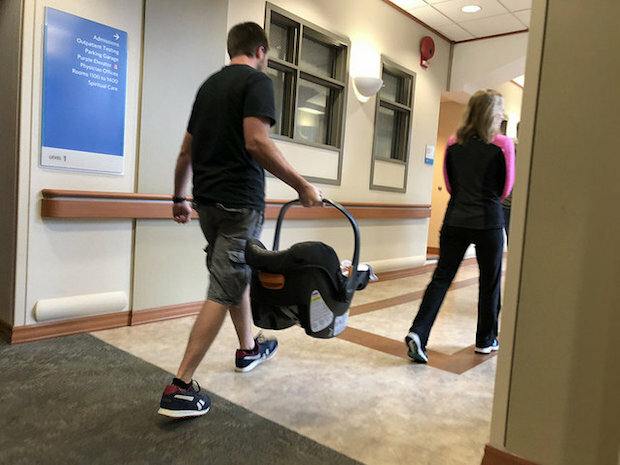 The midwife thought it was a good idea for Jimmy to call my mom and dad to get some support for getting Sadie into her car seat and driving over to the hospital, so my parents headed to the birth center and met him there to help out. We were so thankful they could drop everything and come help us. The ambulance ride was interesting. 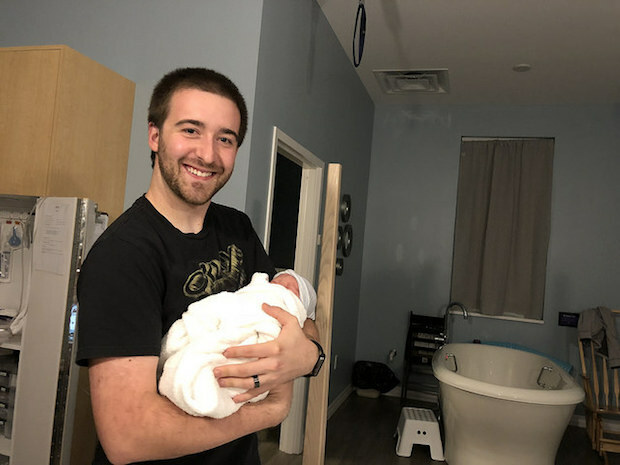 I could tell the paramedics weren’t fans of the birth center, and they made it pretty clear to me by asking why I didn’t have IV fluids during the birth and why I hadn’t had my blood sugar tested during and after labor due to my gestational diabetes. I was too tired to really explain how much of a whirlwind everything had been, so I just tried to chat with the paramedics about their day and thanked them for transferring me. I arrived at the hospital and had my blood drawn to check my hemoglobin levels. They were still low after the four iron infusions I had during pregnancy and it was confirmed that I was still anemic. I’m so glad I decided to go through with the infusions during pregnancy, because I’m not sure what would’ve happened with blood loss and passing out if I hadn’t. The nurses in the hospital monitored me while I waited for my parents, Jimmy, and Sadie to arrive at the hospital. My hematologist was okay with my hemoglobin levels as long as I was stable and not passing out because I already had another iron infusion scheduled a few weeks later. I was so relieved I wouldn’t need any infusions right then and there! My parents, Jimmy, and Sadie arrived about an hour after I was admitted to the hospital. It was amazing to see all of them and I cried happy tears! From that point on, it was just a waiting game of me being monitored until I could be released to go home. While I was waiting to be discharged, my brother and sister-in-law came to meet Sadie and brought us all coffee! 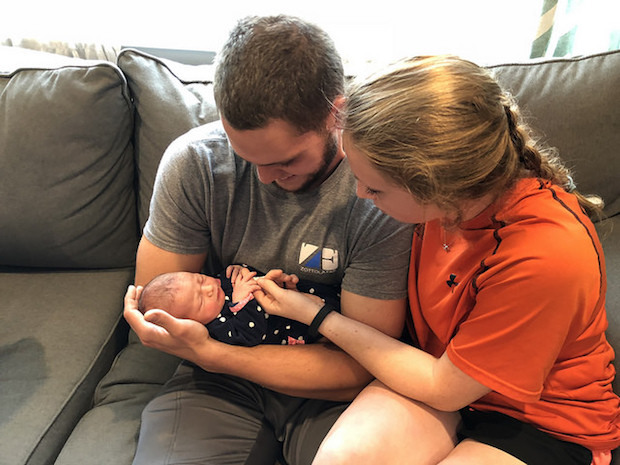 Having them there really got my mind off of the craziness that had ensued and it was such a joy to see them interact with their new niece! By 3:00 PM, it was decided that I was good to go and we were discharged and on our way home! Everyone in my family wanted to hang out with us and Sadie and help Jimmy and I since we hadn’t slept the night before, so we had a pizza party at our house with my siblings and parents. Well, I should say they had a pizza party. Jimmy and I got home and crashed. We slept like the dead for a few hours while my family passed Sadie around and we were so, so thankful for their help! I will never forget the events if that say Allie, tears of joy! So proud of you and Jimmy you guys are the best parents ever! We’re so glad you could come and so thankful for your help with the transfer! Thank you! We love you so much! I’m so glad you didn’t need anything and got the support you needed during the recovery process! Sounds like quite an experience on top of giving birth to Sadie! Yes, me too!! Thanks, Maureen! It was quite the experience! I’m glad everything was okay and that you didn’t need another infusion right away and got to go home. It sounds like a very scary experience though! Is your anemia better now? Just curious! Same here! It was such a relief! As of September, I’m still anemic, which is crazy after four iron infusions! I go back to my hematologist this week to check my iron levels and get my fifth infusion! I’m so ready to not be anemic, lol! It was tough and a little scary, but we made it through! That’s SO scary! God had His hand on you, for sure!! 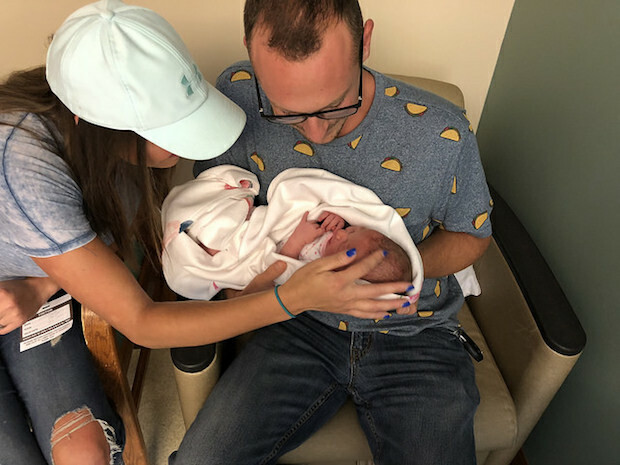 (I remember the catheterization process from when I had Brady… With Kaitlyn, I could pee right after the C-section, but I struggled with it during my recovery with Brady. So I had to go through that, and it was NO fun, I remember)! I’m SO glad that you’re doing well and that God had His hand on you throughout the birthing process! Amen, God had His hand on us! The catheterization was so rough! No fun, but Sadie is worth it a million times over! So, so true about the sacrifices and pain of birth and parenting! I couldn’t have said it better myself! I’m soooo late to this party, but huge welcome to Sadie! Thank you sooo much! I’m so glad to see you back in blog-land! That was such a hard moment! But we made it through! Thankfully we were able to be cared for and we all went home healthy and happy! Amen, praise God!!! It was crazy, but we made it through! I’m so glad you enjoyed reading! It was a crazy experience! I’m so glad we’re all healthy and good to go now 🙂 Thank you for your encouragement! Such a scary experience. You were so strong and brave through it. That had to be so hard to be by yourself – I’m glad your family wasn’t too far away. I’m also so glad that you didn’t have to go through an infusion right then. Home was where you needed to be and I’m glad you got to go there relatively soon. It was definitely intense! Being by myself was tough, but it was such a short period of time and I think it really helped Jimmy’s confidence in his dad skills early on! I’m so glad I didn’t need an infusion then, either! That would have made for a long day, lol! 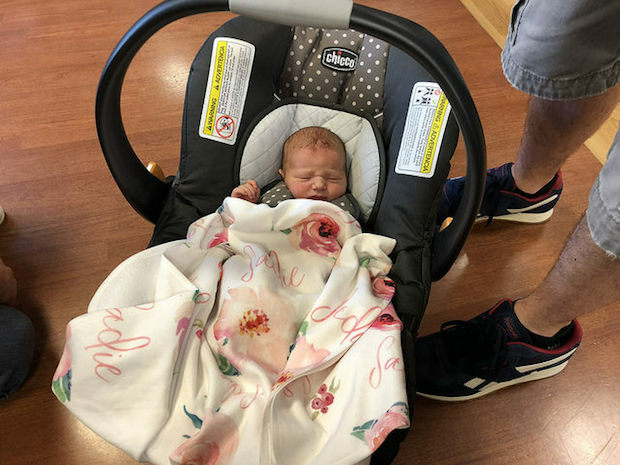 We felt so blessed to be able to go home the day Sadie was born!